Home » Action » equal rights » Equal Rights Amendment » Feminism » Human Rights » Justice » Racial Justice » Reproductive Justice » Resist » Unite » Voter Rights » War On Women » Women's Health Care » Women's March » Women's Rights » We Are Woman is proud to be an official partner of the Women's March on Washington January 21, 2017! 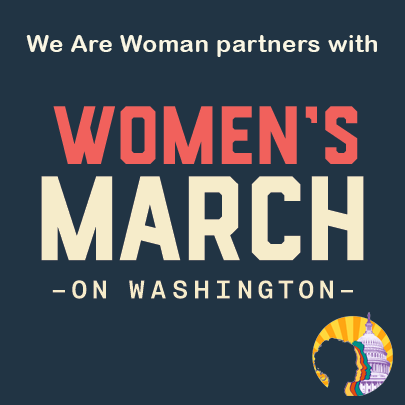 We Are Woman is proud to be an official partner of the Women's March on Washington January 21, 2017! Together, we will send the message loud and clear that women's rights are human rights! We will NOT go back! If you are interested in marching with We Are Woman, or volunteering please let us know. We stand in solidarity with our partners and children for the protection of our rights, our safety, our health, and our families - recognizing that our vibrant and diverse communities are the strength of our country. Can't make it to DC? Find a Sister March in your area!